Until recently, many people thought eating too many eggs was bad for you. There is cholesterol in eggs, which was thought to contribute to diseases like heart disease. However, recent changes in the Dietary Guidelines for Americans have shown that the healthy fats in eggs are unlikely to cause illness. Like all foods, eggs should be consumed in moderation. Eating two eggs a day can be a healthy choice, as long as you're watching your overall calorie, fat and protein intake. Eggs are a healthy and nutritious food filled with many beneficial nutrients. It's fine to eat two eggs a day if you're healthy, but people with a history of heart disease or other conditions should only consume one a day. The American Heart Association recommends one egg per day as part of a healthy diet. In fact, an egg a day may help to reduce the risk of heart disease and stroke. However, eating more than one egg a day hasn’t been shown to be harmful for most people. A 2018 study in the American Journal of Clinical Nutrition showed that consumption of up to 12 eggs per week won’t have negative effects on your health — at least not over just a few months. It's important to note that consistently eating more than one egg per day could be harmful to your health if you have diabetes or are at risk for heart disease. However, for most people, eating two eggs a day now and again isn’t likely to be harmful. Just be conscious of your portions of other high-fat foods. Everyone knows that eggs are rich in nutrients. 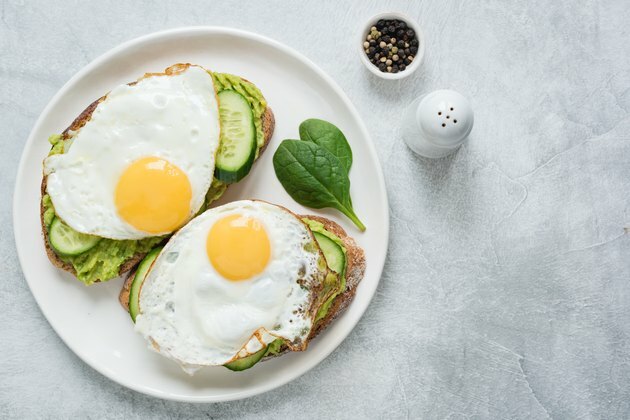 According to the American Egg Board, eggs have vitamin A, several B-complex vitamins, vitamin D and vitamin E. Eggs also contain calcium, copper, iron, magnesium, manganese, phosphorus, selenium, sodium and zinc. On top of all those vitamins and minerals, eggs have other beneficial nutrients, like protein. They also contain lutein and zeaxanthin — nutrients that can help keep your eyes healthy — and healthy polyunsaturated fatty acids. These healthy fatty acids are similar to the ones in fatty fish and other omega-3 rich foods. Eggs are particularly well known for being healthy vegetarian sources of protein. This is good news for people who are on high-protein or ketogenic diets. According to the United States Department of Agriculture, each large egg should have 6 grams of protein. Because, on average, men should consume 56 grams of protein per day and women should consume 46 grams, each large egg could contribute 10 percent or more of your recommended dietary allowance for protein. Large eggs are the size typically used in recipes and research studies. This is important, as the nutrients in an egg will change based on size, as will potentially negative factors, like cholesterol. The USDA says that eggs can range from 1.25 ounces (peewee eggs) to 2.42 ounces (jumbo eggs). If you’re eating eggs from a different bird (like a quail) or peewee-sized eggs, you’re likely in the clear to eat two eggs a day, or even more. Equally, eating jumbo eggs, which each equal two peewee eggs, might mean you’re eating more egg than you might think. Harvard Health Publishing: When it comes to protein, how much is too much?